In 2011, "Monsters Inc." will be celebrating its tenth anniversary. There is some early talk right now among Suits in Burbank and Creatives in Emeryville of another limited release of this Pixar classic. If all goes according to plan, we should see another two week release of the original Pete Docter film in 3D and maybe another surprise with it; if it hasn't been announce already by then. This limited launch will prove the perfect opportunity for those that have never seen it on the big screen and those who haven't seen it at all. I'm also predicting a 3D re-release of Cars, which would actually look quite dazzling. 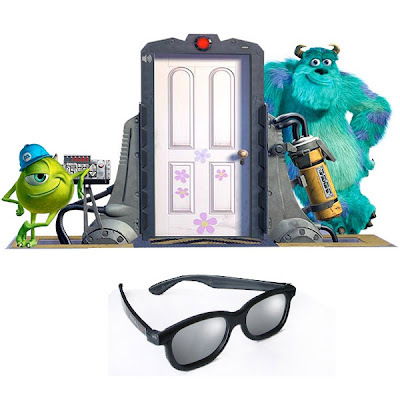 As for Monsters, Inc. in 3D, I can only imagine what the door chase sequence will look like. 10th anniversary for Monsters in 2011 already? My how time flies! I've assumed since Cars 2 and Toy Story 1&2 in 3D were made official in that big showing that a re-release of Cars would be on the horizon. and Monsters, Inc. 3D this time 2011 for the 10 year anniversary? I will look forward to this movie! Like other animated film, I think this one is different! Honor, was the re release really considered a success it didnt even bring in 15 million? was it the threshold Disney was looking for ? To me I was suprised the BO numbers came in low. I was thinking Iger might of been concerned considered one of the most valuable franchises is coming out with TS3 in 2010, and could barely muster up roughly 15 million at the box office. Come on! These are very old movies, already available in DVD; together they run 3 hours in only 1700 cinemas. By the way, did you hear that Beauty and the Beast 3D was pushed back to 2011 for the 20th anniversary? if so theres no excuse for getting some other projects on the go ion the meantime. I.e. shorts.